The media has become this crazy tool or entity or whatever you may call it in society. I just started a new semester in Grad school and the class I am taking is called Research and Methodology. For our final project we have to pick a topic and thoroughly research it….so, of course, I went to the handy dandy media tool called the Internet to browse some topics. The golden lightbulb went off and I realized I could kill two birds with one stone and also find an array of topics for blog questions…Genius right???? I stumbled upon this topic and I was intrigued. The media has fascinated me for quite some time now. It has become this thing (and this is a bold statement I know) that I believe has potentially brainwashed us as human beings. George Orwell in the classic 1984 always spoke about Big Brother watching us and I believe at this current time Big Brother is the media. We have two major new stations, Fox News and CNN, and from the perspectives of Democrats Fox News is far right-winged but out of the mouths of Republicans, CNN veers far to the left. Is there really a possibility for fair, unbiased reporting??? I think not. No matter how unbiased someone tries to be they are going to convey their emotions through their body language and tone of voice. Some reporters will blatantly tell the people where they stand on the issues. For example, Nancy Grace spent a year if not more reporting on the Casey Anthony case. From the very beginning she had Casey Anthony pegged as a murderer. She showed the public how disgusting she found her to be. Now, don’t get me wrong, I believe Casey Anthony murdered her child (and if it wasn’t by her hands…she surely was a part of the plot) but Nancy Grace surely didn’t not report in an unbiased manner. Most media stations did not. The same goes for the Trayvon Martin case. Most media stations pegged George Zimmerman as a murderer before any details about the incident even surfaced. Again, I have my opinions but I was not present in either situation to know what really happened. I will admit that the media swayed me. Is it there job to do this? If you think about it, isn’t that kind of twisted? In my opinion, there is really no way to report the news in a completely unbiased way….at least not in a way that is going to keep the viewer interested. I mean, if you turned on the TV and a broadcaster sat there completely dead pan speaking in a monotone voice reporting two sides to every story, what are the chances that you would sit there and watch? I am guessing slim to none. I do believe that as technology has boomed and time has passed that media has worsened. That is strictly my opinion though. We have become a nation that thrives on entertainment and even the news is becoming a source of entertainment. Maybe I am just a Debbie Downer but I would rather news be informative as opposed to entertaining…not implying it needs to be boring but seriously, what impact does Justin Bieber’s wardrobe have on the world and why do journalists/media specialists believe this is worthy of front page news??? Don’t get me wrong…I admit that I do not always practice what I preach. By no means at all am I perfect. I will totally get sucked into celebrity gossip and stories that hold no relevance to my life (i.e. prodigy babies, or animal tricks). I am just answering the question at hand. I am just wondering how far media is going to go to catch the attention of its viewers. I am the type of person that will question everything…not necessarily out loud though. I have this insane curiosity about why people do as they do and why things work the way they do. I am always wondering how the world works as a whole and sometimes I think of some off the wall things. I sometimes think we are all just living in a dream. I have even wondered if we are just a figment of someone’s imagination. I don’t have the answers to anything because I find it impossible to have solid answers….even with theories and graphs and data and charts. I have a hard time believing anything to be 100% truth so of course I cannot believe that the media is ever going to provide us with unbiased news and information. We have become a country that is absolutely money hungry. We will put whatever we want out there if it sells….it doesn’t matter if it is not true or if it is completely sexist or prejudice. We have women reporters nowadays that wear low cut shirts showing off extreme cleavage or skirts that hang far above the knee. You don’t think that was planned? Don’t get me wrong, I am not an extremist when it comes to fashion and how I believe women should dress. I just believe that a woman in journalism should portray herself professionally…not show off her goods in order to get higher ratings. I realize though that the news station itself is largely responsible for that….I just have to question what message that is sending to young girls. 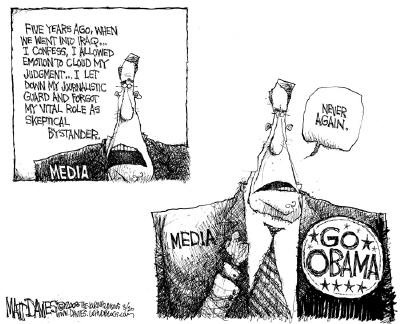 The media has become the thing that makes the world go around every single day. Media has started controlling the population and that will continue far after my years on this planet. I don’t believe there really is a way to make media completely unbiased but I do believe we have choices when it comes to what we are allowing the public to be exposed to. We hear about the rates of teen pregnancy sky rocketing every year but we choose to have Jersey Shore running on a constant loop almost everyday….and if you haven’t tuned in…these people sleep with multiple people (that they don’t know) almost daily. Why are we sensationalizing bad behavior? I don’t believe the government should control and censor television but there are lines that people can draw. I guess I have just become completely astounded by the power that money can have over people. Family values and humanity just don’t hold the same value these days because so many people are chasing after the good old American dollar. My goal is never to be negative….although this post may not prove that at all. I guess I just have to remind myself of certain things in order to keep striving to hold onto my family values and to hold onto what is important to me. Media can be extremely influential and I am constantly questioning to truth in anything I am exposed to. The idea of stories being fabricated in the media just seems so disgraceful and wrong…is money really worth more than morals? Having worked both sides of the fence as a reporter and a media spokesperson for large compqnies and government I can assure you that most news is created or slanted to sell advertising. I take half of what is reported and believe about 5% of that. All the more reason to teach quality journalism: blogging is the future. If you think about a historical context, there is an “information war” – much of it about profit – and the new ‘information exchange’ will increasingly be online, in blogs, etc. — which of course is the reason governments and corporations are trying to get control over it. The answer is no, they sell biased error-prone news. Question everything you read. You have to take into account that most of the TV news stations are owned by one of the two giants in communications. Also, most of the “news programs” are actually “opinion programs” but most do not differentiate for the public. They say that the public knows when it is opinion and when it is news. I have watched news in Fox and they are just reading what is given to them, no giving actual reports. CNN is similar, NBC the same but I have found that Fox tends to be the more extreme in their opinions. I actually like the Daily Show and the Colbert Report. They are biased but at least they give extra information on many things that the news outlets do not mention or just mention half the truth. BBC is really good for unbiased opinions as well as NPR. So, all in all, no unbiased news reporting but you can dig and find more truth than they give. 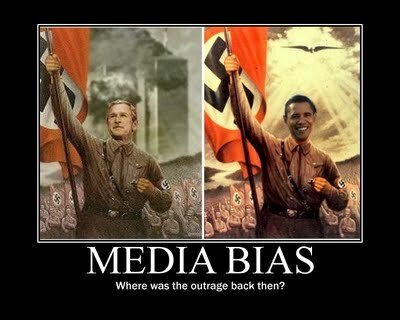 JMO: All news/media is biased. It is the human condition to be biased. My belief is that everything is “stylized” to control/influence audience/market. Paranoia? I don’t think so, just keeping it real. Following twittering and tweeting on the news hour has cured me of watching the news. For good. Always questioning, I may never get answers or the answers I would like, but that won’t stop me questioning. I love this piece and didn’t find it negative at all, very real. Thank you for so eloquently discussing something often on my mind. If you vote Republican or even if you vote Democrat, the odds are good that you wind up voting against your interests. I began blogging in response to being told by politicians and pundits alike that they knew what Americans were thinking. So rather than talking back to the TV as I was doing on a daily basis during the 2008 Presidential campaign, I decided I needed to make my thoughts known. Whether or not they went anywhere was not the point. At least I was giving voice to one American’s opinions…my own. Just because pundits and politicians get air time, doesn’t mean their opinions are more valid than mine. They are very good at “spinning,” and of course, the world is their stage. A huge disadvantage of 24/7 news, as introduced by CNN, is the constant yada, yada, yada, about the same topics of which there might only be a handful. The more you hear the spin, the more it becomes established as truth. 90% of the spinmeisters should be fired. They’re like tentacles on a giant octopus…hanging on just because thhey can. Watch all of it at least once, and think “Info-tainment”. That’s what most of it is, and that’s what you get in a totally profit oriented world. Thanks for following my blog. :). Anywho, when the fact that news channels were biased toward politicals parties dawned on me, I could never watch the news the same again. I always ask myself when watching, “I wonder what they really mean”. Girl, do not get me started on this because I am sitting on 5 different drafts in this very same topic. I no longer own a television, nor do I read or listen to the news. I have pulled away from American media almost completely! BBC for news. American networks are gun shy after Vietnam. They reported too closely, too graphically. Traveling opened my eyes to the isolation approach American media has taken.